During winter, ice slabs and lumps of snow falling from truck roofs are a potential hazard for traffic. To prevent this, Zarges has developed a modular de-icing and maintenance platform for trucks. The platform has an adaptable length and can be accessed via a flight of stairs.This allows snow, ice, water and dirt to be quickly removed in a safe and economical manner. The work platform is frost-resistant down to minus 30 degrees Celsius. A telescopic scraper can be used to remove snow and ice at the platform's working height of 4.80 to 5.00 metres. The all-round railings and anti-slip, open-grid steel surfaces on the treads and platform reliably ensure a safe working environment. The Zarges construction is especially sturdy and excels in terms of its quality and user-friendliness. 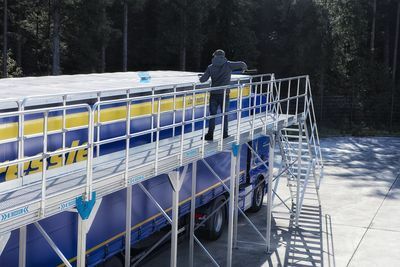 Thanks to its innovative connection system, the de-icing platform is quick and easy to assemble and can be accessed comfortably using a staircase with a 45-degree incline. Because of the modular design, the 6.0 metre-long base module can be extended as required by adding a 6.0 or 2.0 metre-long extension module. This allows cleaning and maintenance work to be carried out safely on a truck’s roof. Another advantage is that Zarges no longer customises each de-icing platform to a specific order, but rather produces standard modules. This means that the product now costs less and can be delivered more quickly than before.